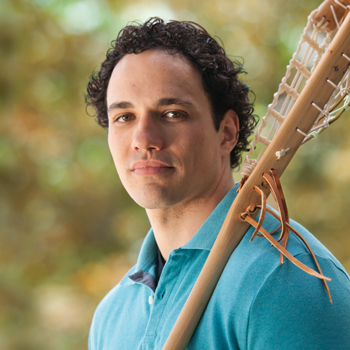 Wilfrid Laurier University alumnus Allan Downey (MA ’08, PhD ’14) will return to Laurier's Waterloo campus April 3, bringing his passion for the game of lacrosse full circle. Downey will kick off the launch of his first-ever book The Creator’s Game: Lacrosse, Identity, and Indigenous Nationhood with a reception, reading and book signing at Veritas Café beginning at 1:30 p.m. The Creator’s Game focuses on the history of lacrosse in Indigenous communities from the 1860s to the 1990s. Through it, Downey explores Indigenous-non-Indigenous relations, Indigenous identity formation, and the cultural appropriation – and reclamation – of lacrosse. The book is the result of Downey’s doctoral research, “The Creator's Game: Aboriginal Racialized Identities in Canada's Colonial Age, 1844-1990,” supervised by Susan Neylan, Laurier associate professor of history. The event is co-sponsored by the Office of Indigenous Initiatives and Support Aboriginal Graduate Enhancement (SAGE) Laurier, an interdisciplinary student club dedicated to supporting Indigenous graduate students at Laurier. This is SAGE Laurier’s first campus-wide event to celebrate Indigenous graduate students. The Creator’s Game was released in hardcover on Feb. 1. The paperback edition is scheduled for release in August 2018. A limited supply will be available for purchase at the event and Downey will be available for signing. All members of the Laurier community are welcome to attend the event, which is free of charge. For more information, email sagelauriercoordinator@gmail.com or visit SAGE Laurier on Facebook.